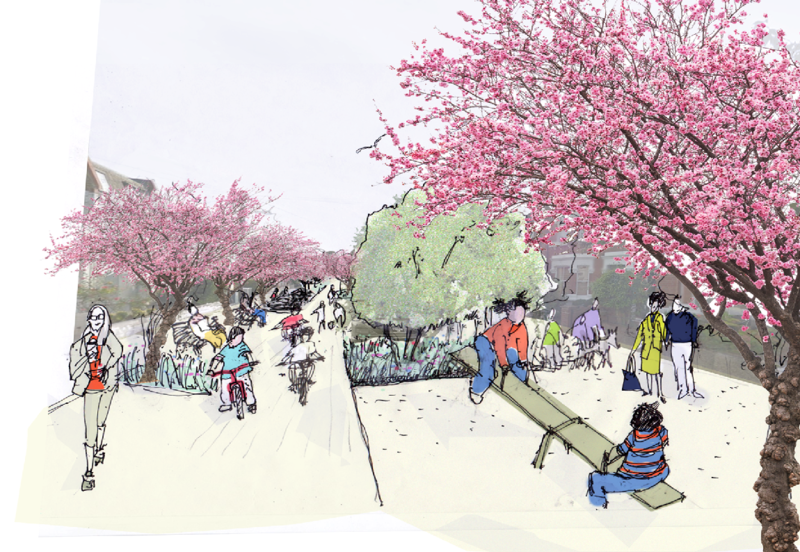 A recent BBC News feature presented an exciting future of streets without cars, of streets given over to orchards, of spaces for neighbours to talk, of mini utopias. All enabled by self-driving cars that can be summoned to your door. When I hear grand predictions like these I am sceptical - burnt by technology hype (what’s happened to the much vaunted internet of things?) and the experience that such technology change requires behavioural changes too. But, with the financial clout of Google and Apple's billions being poured into making the driverless car dream a reality I have no doubt this will happen soon. ... it's a giant car park with a road running through it. If you are at home look out the window and imagine taking just ten cars away. It will free up a 40 by 20m area - space enough for a small park. How could it be used - an orchard, table tennis, benches, a communal bbq, and a veg patch...Giant Jenga? So while my street is still full of cars, car ownership in many cities is peaking. This is partly driven by the adoption of technology that already exists - uber, car clubs like zipcar and easycarclub are all helping to reduce car ownership. For instance in Hackney in the last decade population has increased by 45,000 but car ownership has fallen by 3000. And I've noticed that it's that bit easier to find a space on my street. So now that many cities have hit peak car let's start thinking imaginatively about how we use the space freed up... Let's pressure our councils to raise the cost of parking permits and let’s use the money raised to repurpose parts of our streets. We can start creating mini parks today – perhaps not whole streets but part of them – given over to serve people rather than cars. That inspires me - I'm prepared to give up my car in favour of a mini park and I think others on my street might be too. Post your thoughts below! Our streets and our experience of our neighbours would become very different - perhaps for instance, the forgotten elderly would find a natural place to come and meet their neighbours in the summer. This, in my opinion, is more exciting and more far reaching even than driverless cars - and it could start happening today. Sam – a bit late to the conversation I know, but thought you’d like to know that we held our first street party yesterday, no cars on most of the street (everyone has drives, but some how the street is also full), the sense of space was amazing. Lots of ball games, races, tables of food and drink, lots of people meeting each other for the first time. We are lucky enough to have grass verges, which we will transform by planting bulbs in the autumn – and perhaps, given your post, a few fruit trees would be really welcome – we have discovered lots of gardeners in the street now that we’re talking more! In big cities and towns it is possible to give up individual ownership of cars. Simply give up the car, save the money you’d spend on annual MOT, insurance, resident permit parking fees and use this instead to hire cars and vans when you need them. It is also much healthier and more fun to walk, cycle, bus or share a taxi ride and with Uber now offering Pool or Shared taxis this is getting increasingly easier. If 50% of people living in towns gave up their cars that would be a huge reduction in pollution, the streets would have fewer motorised vehicles and more bicycles – like much of northern Europe does now. I’m a father of two living in Birmingham. Just over a year ago I had a minor accident and decided not to replace my car as an experiment. I joined co wheels and never looked back! “For instance in Hackney in the last decade population has increased by 45,000 but car ownership has fallen by 3000. And I’ve noticed that it’s that bit easier to find a space on my street.” Only a 3,000 drop? Assuming these are absolute numbers, it’s pretty obvious most of the gains have been blown away by population growth. So why so enthusiastic about car-sharing technology when the population is still growing so much? I’d focus on that issue if you really want your dream of re-purposed streets and car parks to come true. Maybe Brexit will help a bit. And here’s another Ted talk which includes an idea I like – that of giving people democratic access to roadspace. In other words if a bus has twenty people on it, then perhaps it should be entitled to twenty times as much road space as a single-occupancy car. I think we don’t need to ban cars to reduce their dominance. This is a revolutionary idea! We’re going to have to give up a lot of things if we want this to become a reality, however, we’re not going to miss what we’ll give up. 1) Being able to use a car when needed (for example for the weekly shop or for transporting bulky items or for those with mobility problems) rather than owning a car. This would mean a growth of car clubs, possibly as social businesses, with an emphasis on electric cars and a network of charging points running on renewable energy. 2) Building a steady-state local or national economy that is not dependent on consumer-based growth but on quality of life and time. Cars are not only clogging our streets, numerous studies are now showing that their pollution is damaging our health. It’s time to suspend our cynicism and believe a different London is possible. Like many of the others who have commented, I like the vision but I don’t believe in it. Declining car ownership doesn’t mean declining travel, it means there are other ways to travel that some find more attractive. To have streets like those in the vision, people would have to want to spend more time in their own street. The idea of turning our street into mini gardens and play areas is a dream that died in the early 50’s as eileen pack as stated, economics growth is built around machines that makes our lives easer and by product related to them. If you break down the components that makes just one car and maintain it you are talking about hundreds of workers. I live in a area where 90% of property have a drive way, I also have a bus stop opposite my bungalow, I’m 70 years old and while manufactures produce car that is as comforable as sitting in front of your television, no one is going to give up their driving the car forever, The ideal solusion is pull down inner-city suburb and build four lane streets, could you see that happening? It’s about thinking outside of the box – you do not need a car draining your money and polluting your streets – you can car share, travel sustainably (walk or cycle), get a taxi, use the bus, travel with friends etc. The street where people come together, children play, food can be grown, trees planted is all I really want and it would lead to so many excellent knock-on effects, all of which mean people care about the place they live and aren’t simply driving through as fast as possible. It would be so incredible. I would help someone to transfer a paved space to a garden. I am doing that at my home now. I am a volunteer gardener at Fulham palace gardens and we have plants for sale at good prices. But first we’ll need to prepare the soil… Contact me! I like the inspiration to imagine an alternative but it otherwise looks like a big advert for Claire. Join your local [City] Cycle Campaign if you’d like practical means to promote a better transport future and community amenity. Sounds great but main thing to remember is that we live in a (dare I say it!) capitalist society where the most important thing is economic growth . Cars and road building are a massive part of the economy in the UK. Although care are mainly made abroad, look at the employment and money made by car repairs, selling petrol etc, road building and repairing. Much more lucrative than railways which is why roads have always taken priority over increasing our railway network. Economic growth always takes priority over our human well-being which we see daily as local community centres, school playgrounds, libraries, court houses, etc are sold off for re-development. People friendly streets are a great idea but they will only happen if someone improves public transport dramatically and finds a way of making money out of selling children’s playground equipment and trees to go some way to compensating for the loss of investment opportunities which the car industry represents. What Landscaping friend Claire failed to see is that the brief was to imagine how a driverless car would be able to come to your door and whiz you away through the pedestrian heaven drawn here. Also, I thought the idea was to take just 10 cars away and imagine an open space in between other cars. The whole thing is not well thought out. Either we do without cars or transport which is impossible unless we build an interconnected city with a kind of jubilee line going through, sucking passengers in one door and vomiting them out at another which can be drawn as a magic kingdom, or we can have the kind of dystopia shown in ‘Blade Runner’ for instance and I didn’t see a tree in that I don’t think?? As someone else’s said, in central London you don’t need a car and public transport can be better thought out, but outside, perhaps we can train seagulls and red kites to transport us to our destinations? We gave up our car 6 or 7 years ago and have only hired one on the rare occasion that we need to travel with something that cannot be transported using the public methods (in one instance a wedding cake!). 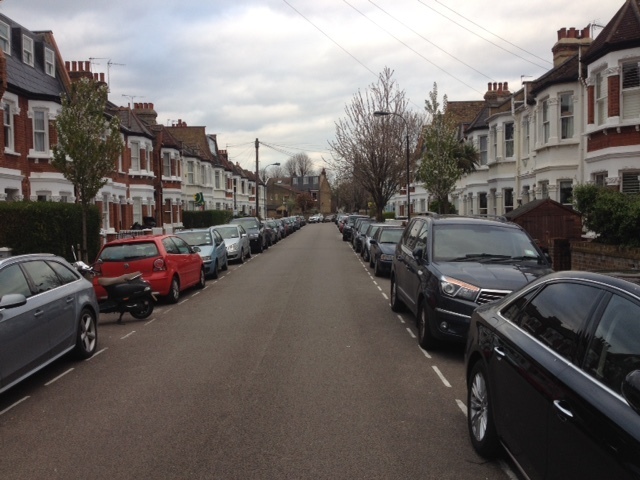 I have noticed that there do not seem to be as many cars parked on our street as when we had a car. I would love to see more trees and have less noise pollution….in a climate change environmentally aware society, this is exactly what should be initiated rapidly. A city without cars would be great but we need to be realistic. If you live and work in central London, it’s easy to be without a car – which I did for many years. But outside of London, public transport is inadequate and expensive. I cycle and use public transport whenever I can but I often need may car for work. Before you start campaigning to increase the cost of car ownership, please think about those of us who earn little and need our cars. Pricing people out of car ownership just gives more privilege to the well-off. There are many people who could use their cars less – lets encourage walking, making cycling safer but to get anywhere near your vision, we need improved and cheaper public transport. The forgotten elderly would be more forgotten as their family, friends and careworkers can no longer visit as regularly because visitor permits are limited to perhaps 1/week or they can no longer park outside their homes and lose personal mobility. The same applies for people with mobility problems and mental health issues. Parents with young children become isolated. People with unstable employment, on zero hours contracts find it harder to access work as public transport doesn’t allow them access at short notice to random workplaces. Weekly family meals would get cancelled as visitor parking permits would run out within a couple of months and offspring living and working in disparate areas find public transport doesn’t fill the gap. Meanwhile, well off folk who can afford property with off road parking continue as they are. It’s a great vision, but for it to come about without disadvantaging some of the most disadvantaged groups of people you would have to have a much better public transport system for starters. The truth is many of us rely on our cars because that is how society is set up, not because we hate the environment or prefer it this way. I personally rejected car ownership until I was 29. I then needed a car to access my teacher training somewhere inaccessible, having to reach different schools across the conurbation at different times of day. When I eventually got a teaching job it was 50 minute drive away. Without my car I would have been unemployed. I couldn’t afford to live away from my parents so I was stuck with the commute. Now I work through an agency I get a phone call first thing in the morning and am sent to a random location. I would not be offered work if I repeatedly turned down assignments because of transport issues. I don’t like working this way. I prefer cycling or walking as I used to be able to. There are many, many other people like me in unstable employment who would be similarly affected. As a suburban family of five, you’d think we need to own a car.. but the reality is different. That’s not to say we’re free of vehicles entirely. We get the shopping delivered fortnightly (in principle they could use a delivery bike – the reality is it’s a van, though the first supermarket to set up cargo-bike deliveries in my area will get my business), we occasionally use taxi/minicab apps like Hailo, Gett, Uber, and we have ZipCar and EasyCarClub membership for occasional trips to places that are awkward by public transport. Mostly, we walk, cycle and use public transport — although the taxi apps are quicker sometimes, it’s not usually so much faster that it’s worth spending the extra. Cycling with kids is much more difficult than it should be, though, because of the lack of quiet, safe routes. If they closed more local streets to through-traffic (leaving them as access-only roads for residents and their deliveries, visitors and tradespeople), I’d be much happier doing so. What I’m getting at is – even though there are always going to be some jobs that need a vehicle, that doesn’t mean everyone needs to own one, even before self-driving cars arrive. A fortnightly online shop for long life groceries saves time, and means you can pop in to the shop on foot a couple of times a week for fresh stuff. Most cars spend 95% of their time parked up – even allowing for inefficiencies in the system, ZipCar-like schemes can potentially replace between three and six cars with one shared one, freeing up a huge amount of road space for pocket-parks and cycle lanes. I mean.. just look at all the depreciation on the street in the photo. A street like that has a million pound’s worth of expensive hardware just sitting there rotting away most of the time. So wasteful of money and finite material resources as well as space. Jo, love your idea of electric Boris Bikes. At one time they were talking about trialling that around Mill Hill, not sure if/when that’s still happening. Electric bikes are great, you still have to pedal a tiny bit, but the motor does all the hard work. I know people who ride them ten miles to work in a suit, without even breaking a sweat! I have never been a driver and I’ve noticed that today a lot of young people don’t drive either. I’ve managed on public transport and (admittedly) lifts but it keeps me closer to my neighbourhood and also keeps me fit – I walk when I can! Streets and cities without cars is my idea of heaven. I love the vision, but it doesnt quite hit the mark for me. I’m ageing and afraid I need a car or some sort of vehicle specially for heavy shopping. I think what needs to happen is the price hike needs to go on petrol, not parking. In this way people would use their car only when really necassary, and the main roads would be less congested, polluted and stressful. The money raised on the petrol should be used to fund public and green transport, including some little vehicles for smaller streets. Also, how about a brand of Boris bike that is electric for people who cant peddle, e.g. due to arthritis etc. If these measures where taken there would likely be fewer cars as a result, as the need fell was reduced. But I think we need to work towards a car free system of transport, or at least only green electric vehicles where needed. But again, lovely vision you have.